Imagine viewing your video content anywhere, anytime, on any screen or device, easily and securely. Display Digital Signage anywhere, everywhere, anytime, under your control. Show live video, text, images, PowerPoint, or web pages. Have unlimited variety of content and displays under your control or the control of your users. 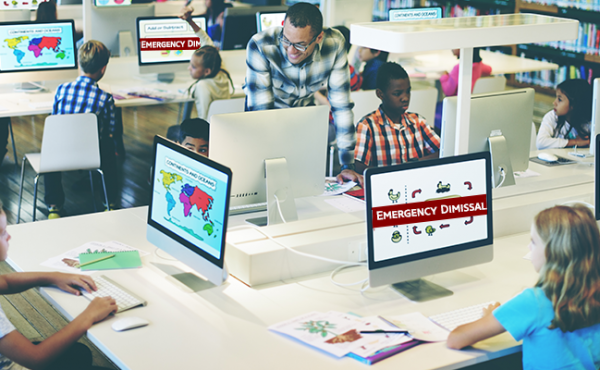 Provide Emergency Communications using Priority Alert to instantly display video or messages on desktops and Digital Signage displays at the touch of a button. 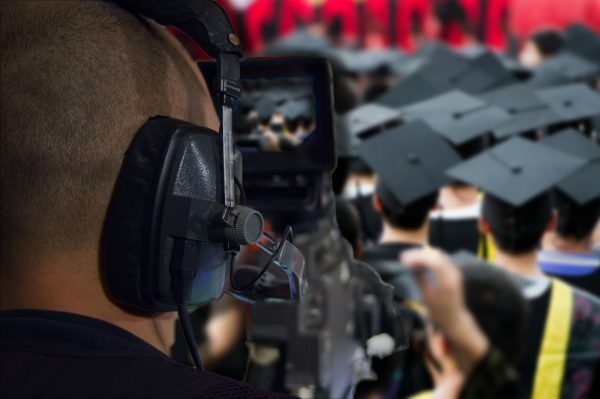 Streaming live video does not have to be difficult or expensive. With DEVOS it’s free and easy! In district-wide deployments, educational organizations use DEVOS to deliver live “morning announcements” from and within each K-12 school. Say goodbye to cable-TV coax. Say hello to IPTV and deliver live TV to all authorized viewers via wired or wireless. Record any live video, including special events, TV shows, sporting events, CEO addresses, meetings, and webinars. Webcast your message to a world-wide audience that you authorize. Include your desktop, or PowerPoint, and give your most engaging talk to your audience and get live survey results and audience questions. 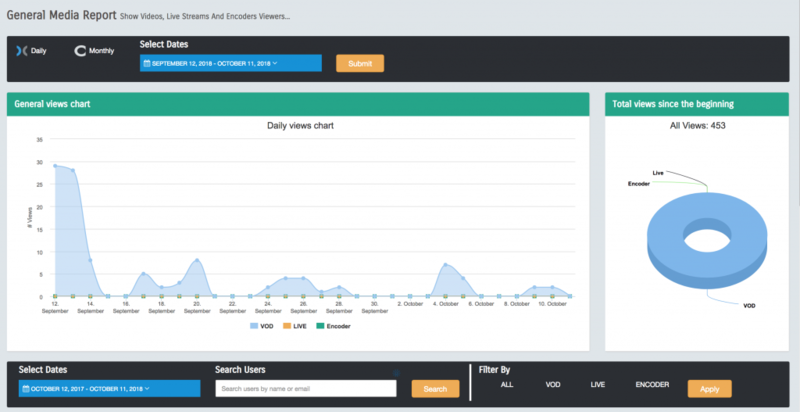 Measure viewer behavior and system usage via comprehensive sophisticated Reports and statistical analysis. Deliver real-time low-delay live streaming with interactive questions, chat, polls, and real-time feedback. Give PowerPoint Presentations directly from the system or share your desktop in real time. Invite people to view your content via SMS or using the built-in Invitation system. Organize your content into unlimited channels, allowing you and your staff to create collections of subject matter of your choice. Teach and Learn with Learning Path. Assemble videos, images, and documents, into organized courses and measure the progress and test scores. Insert questions in videos and know who answered, who did not, and who is struggling. Your IT staff will appreciate our excellent network citizenship. No exotic network requirements. The DiscoverVideo system scales from the smallest school to the largest Corporate environment, supporting 100’s of thousands of viewers. 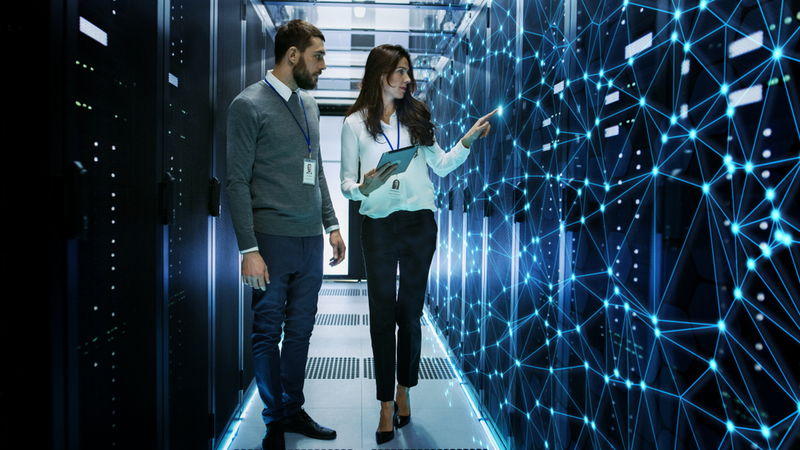 With StreamPumps at remote locations, branch offices can enjoy live video and automatic cached VoD content without using excessive network bandwidth. 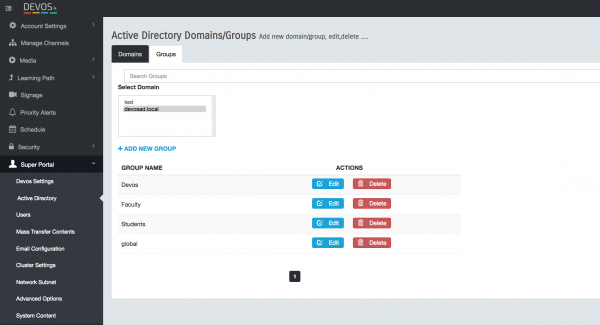 Simple Active Directory integration operates out of the box, giving all users their own, trackable accounts. 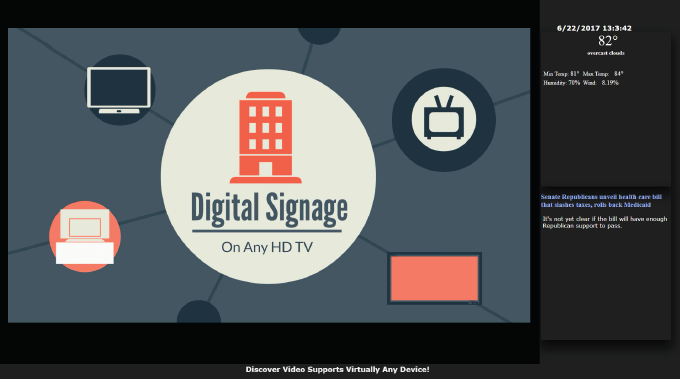 The DiscoverVideo ecosystem includes single and multi-channel world-class encoders, the award-winning DEVOS multimedia server, SignStick Digital Signage devices, StreamPumps, Set Top Boxes, and more. The entire DEVOS system is available as an affordable hosted Cloud solution. Put your content in the Cloud and conduct your live broadcasts to the Internet and to you premises either directly, or with all the bandwidth-saving advantages of local StreamPumps. The DEVOS physical server is available in small, medium, and large capacity. Redundant power, and both SSD and RAID storage provide for maximum reliability. Want to use your hardware? The DEVOS system can be installed on your server or Virtual Machine too. 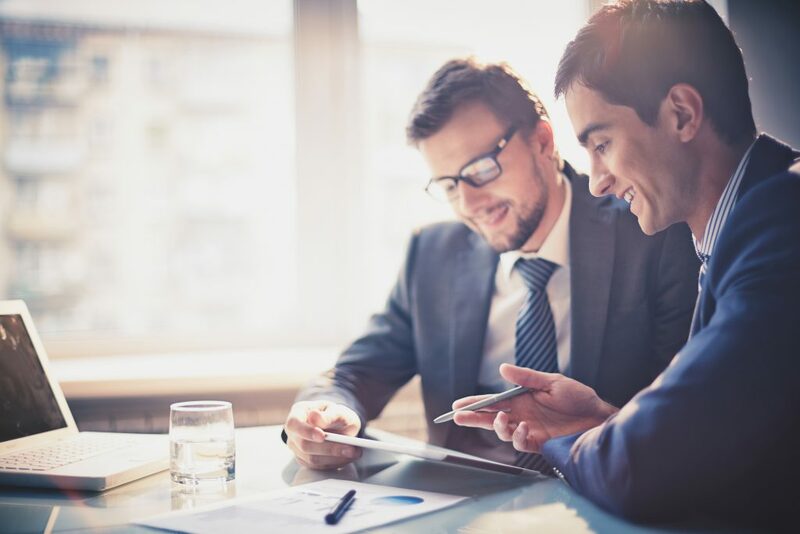 DVExpress is a ready-to-go minimal system, ideal for smaller organizations that don’t need the full DEVOS sophistication but with most of the same features. DVExpress even includes four built-in encoder channels. 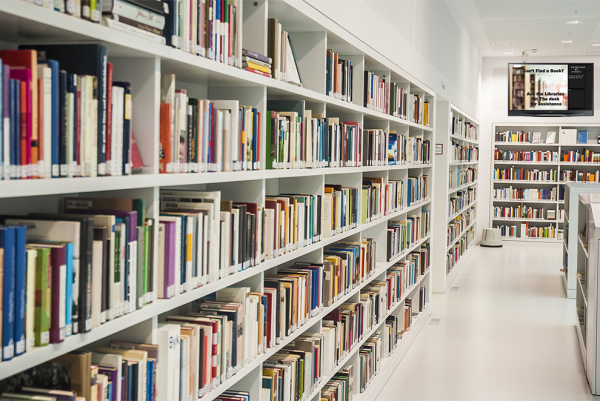 Instantly create your content libraries and organize it as you wish. Give different people or groups access to different libraries. Training, education, information, and other videos are easily organized by searchable titles, authors, tags, channels, and are even searchable by their captions. Upload videos that you recorded with Streamsie®, Mantis™, Spider™, or DV-StreamEngine™, or virtually any of your existing video. DEVOS automatically transcodes your legacy Windows Media, MPEG-1, MPEG-2, and other formats. Upgrading from a legacy video system? No problem, you won’t lose your content. 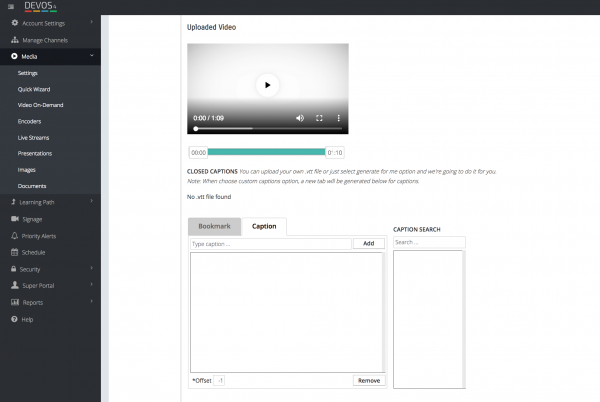 Using the latest AI technology, your recorded or uploaded videos can be automatically captioned, not only for ADA and ethical needs, but to enable more powerful search. And we partner with professional caption services too, allowing you to automatically create perfect captions for any video. Need a video on about particular subject? Find it online and import it from YouTube, Vimeo, and others. Why pay for an expensive content subscription when you can get great content for free? DEVOS video measures and controls access to these videos the same as video you upload. Display news and information in lobbies, hallway intersections, or even in remote locations. Its all controlled and managed by your DEVOS system. And at a touch of a button, one, some, or all of your signs can switch to show a Priority Alert. Just plug in a SignStick, or use a DEVOS signage web page, and your have unlimited Digital Signage for the mere mortal. Simple, template-drive signage includes live video, video-on-demand, even Google Slides! Select a template, add your videos and times, and away you go. Create an unlimited number of content collections. Your “Science Channel” shows science videos. Your “Customer Channel” shows videos for your customers. Each collection has its own security, so your collections are safe from prying eyes. Go ahead, create as many channels as you wish. With 100’s or 1,000’s of live and on-demand videos, you want to be able to quickly find what you need. The DEVOS provides a powerful deep search, allowing you to quickly find a video not only by its title, category, date, tags, or author, but by the closed captioning text. Remember that video where the boss said “pay raise”? Now you can find it! Priority alert is great for showing important news and information at anytime, like live all hands events and morning announcements. When there is an emergency, or when you want to alert one, some, or all users, select DEVOS Priority Alert. The alert will interrupt selected Digital Signage displays and will open on desktops without user action. Show a message, a live video stream, a recorded video, or a web page for the duration of the alert. While Priority Alert can also send SMS text messages with a link to your alert, any live or on-demand video can optionally be transmitted instantly to anyone with a Smartphone. 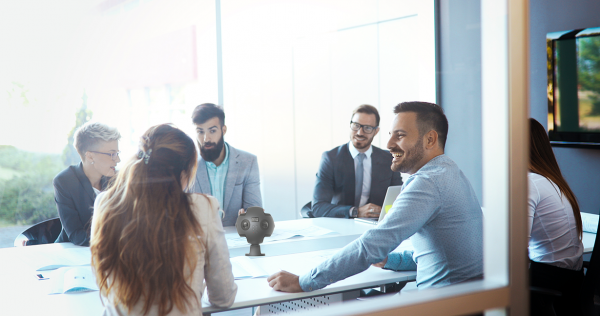 With multiple cameras aimed at a training, simulation, or “focus group” environment, DEVOS allows you to show up to four simultaneous views. Each viewer can adjust their view at will without affecting others. And when you record this Multiview video, the videos play back in synchronism. Now you can fully capture the event, whether multiple cameras or video feeds from instrument displays, etc. Using our Insta360 camera (or other compatible cameras), stream live video with amazing 360 degree capture. The viewer can look around and decide what interests them. Record the 360 video and your on-demand video has fully captured the experience. Want to automatically record the lecture in room 101 every weekday at 9AM? Want to turn the power off on all TV’s every afternoon at 5PM? DEVOS built-in scheduling system controls Discover Video encoders directly, and it can schedule the recording of 3rd party streams too. 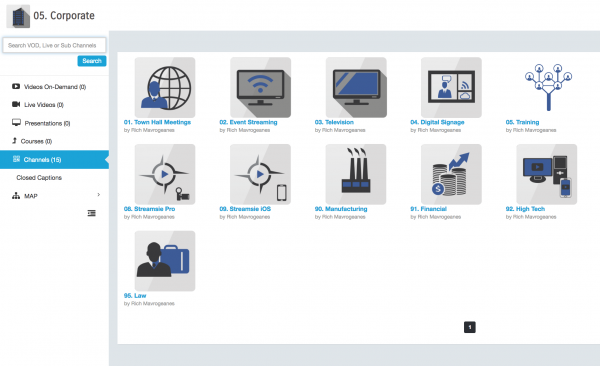 Internet-of-Things (IoT) control of virtually anything via IP or IR control give you the scheduling control you need in a comprehensive enterprise video platform. Your IT staff may be concerned about bandwidth use, thinking that video streaming will swamp the network. Not to worry. Thanks to modern encoding technology the streaming rates are half what they used to be and are very modest by today’s standards. 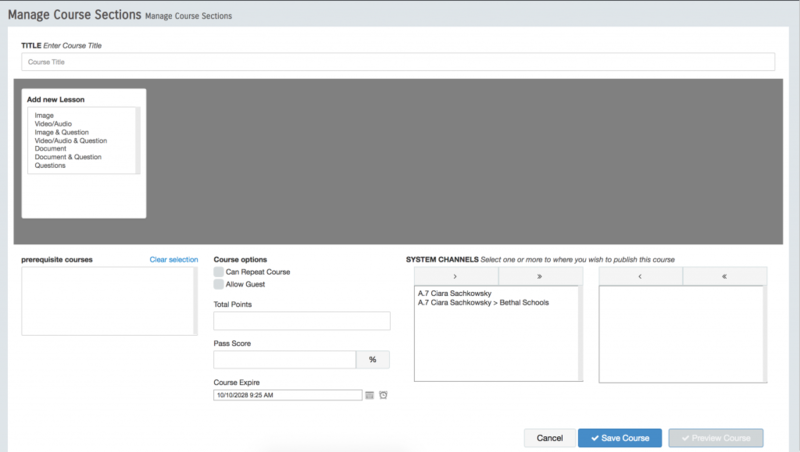 DEVOS does not depend on IP multicast, but it can use it if desired. For remote locations, other building, branch offices, etc., simply place an economical StreamPump and it acts as a bandwidth amplifier for your network. 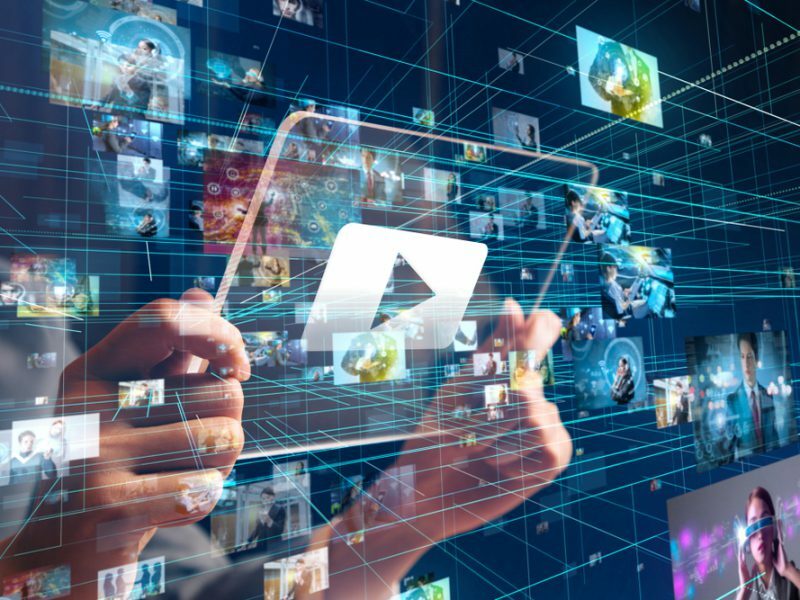 Viewers in those locations actually receive the live and VoD content from the StreamPump near to them, vastly reducing bandwidth usage on valuable network resources. Every DEVOS user can have an account with different levels of privileges. The system owner can manage DEVOS accounts directly or via Active Directory integration. When you stream or upload a video, it belongs to you and other users cannot disturb your content unless you allow them. 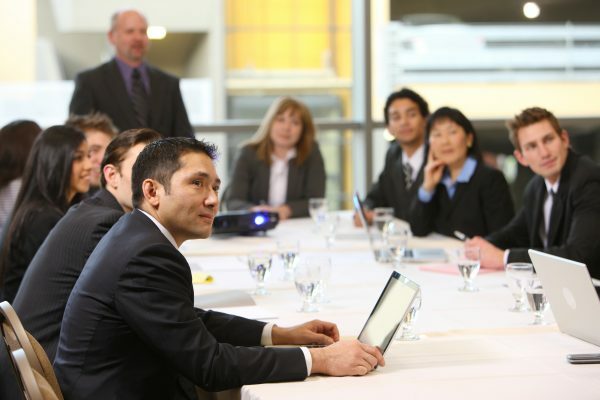 You can even make someone a delegate to manage your content. Or you can create a community of users that can share and manage community content. DEVOS can attach to the Discover Video Arcus™ system when you want to reach a truly large Internet audience and your premises system does not have the bandwidth capacity. DEVOS makes it easy to embed questions in any video and to measure the answers. While this allows you to easily “grade” viewer performance, it also allows you to verify an assigned video is actually watched. 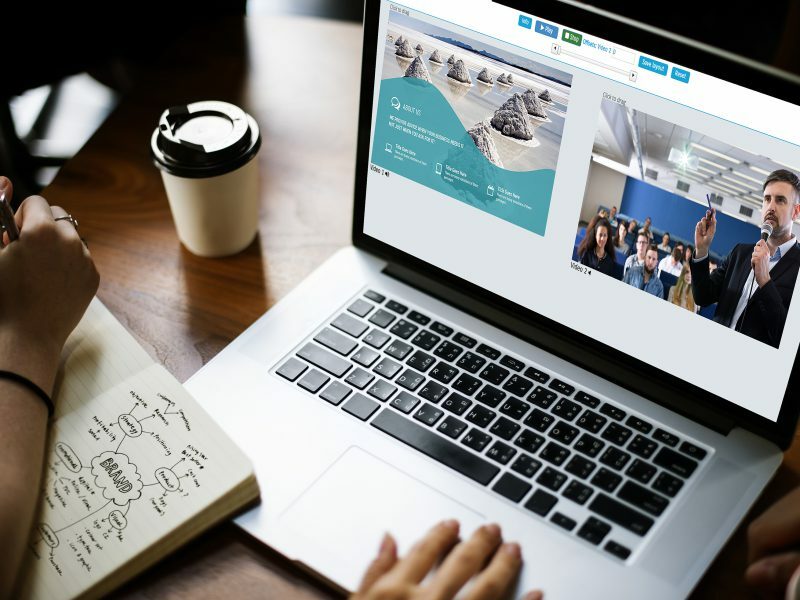 And the DEVOS Learning Path feature allows you to assemble videos, images, documents, and questions to create a full training course, complete with grades and achievement result reports. Want to know More about DEVOS? Supports Streamsie, StreamEngine, and Mantis encoders. Encoders can be remotely controlled and scheduled for streaming or recording. Flash player desktops, or uses HTML5.